A GOOD SOLDIER NEVER LOOKS BEHIND. To ensure the new enterprise had a thoroughbred theme, Tom commissioned a towering statue of a rearing horse to be placed in the forecourt, close to Windsor Rd. The model was based on the conformation of King Tourmaline, a very smart horse in the Sewell stable at the time, and the horse from which the new hotel took its name. That statue became a famous landmark in the district, and stood majestically until it succumbed to the ravages of the elements many years later. Tommy was always fascinated with the theatre of racing, and became an owner in the late 1960’s. His horses were trained by the astute Vic Thompson Snr, and Tom was a regular visitor to the stables. He would ask a million questions when around horse trainers, and soaked up knowledge like a giant sponge. It wasn’t long before he had his own trainer’s licence, and a very workable operation on his property at Vineyard. The features were a 1000 metre work track, sand track, spelling yards and excellent swimming facilities. Tom soon proved himself a very good hand with a horse, and he became well known for the occasional long priced “plonk”. One of his early winners was Asia Minor at Hawkesbury, and the horse was backed in from 50/1 to a fraction of that quote. He executed similar plunges with horses like Red Plymouth, Ruler Man, Jane’s Echo, Pearl Powder, Ocelot, Straight Bar, and Royal Cheam. Tom had a remarkable brain for business, and he’d have a crack at almost anything. There were failures and a couple of smashing successes. Soon after TV started in Australia, he saw some people watching the new medium in a shop window in the city. He knew this phenomenon was about to take off, and quickly deduced that people would need to know what programmes were coming up. He did a deal with the three pioneer TV Channels, found a couple of advertisers and persuaded Gordon & Gotch to get in on the ground floor, and publish his new magazine TV Week. The circulation increased at a staggering rate over a two month period, and before he knew it, he was invited to a meeting with Rupert Murdoch who offered him the unheard sum of 20,000 pounds in the 1950’s. Tom accepted the offer. His business innovations continued throughout his life, and at any given moment he was likely to utter the famous words “I’ve got an idea”. If an experiment failed, he would use his favourite philosophical phrase, “A good soldier never looks behind”. He had slowed down only slightly in his later years, and was still spending plenty of time in his office at home, coordinating his most recent innovation. A few years ago Tom became aware of the massive inconvenience suffered by rail commuters, when trains were suddenly cancelled for track maintenance or a myriad of other reasons. He put a proposal to State Rail and various bus and coach companies, and was able to make a complex operation work very effectively. With great precision Tom was able to ferry passengers to alternative stations, whenever necessary. The job would have tested the resolve of a much younger person, but he was still making it all come together, right up until the time of his passing at age 85. 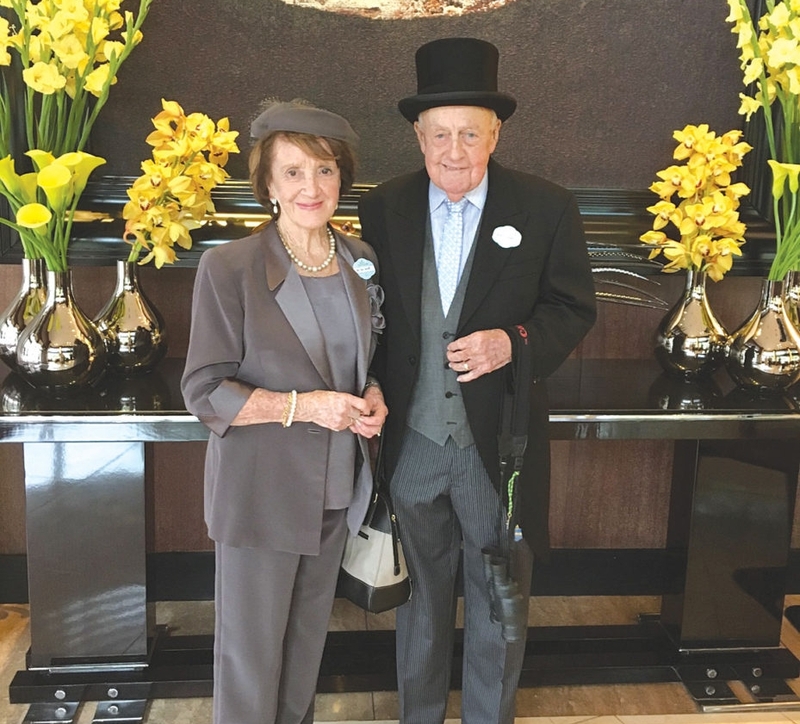 Mr and Mrs Tom Sewell about to leave their hotel for Royal Ascot 2016. 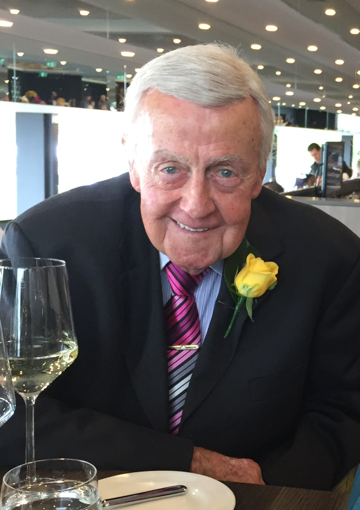 His love of work and a good challenge, and his passion for racing were exceeded only by his devotion to family. Una, his wife of sixty six years has been by his side through every adventure, large or small. Tom adored his four daughters Janice, Karin, Susan, and Robyn who collectively, had given him ten grandchildren, and nineteen great grandchildren. As recently as five weeks ago I enjoyed his company at a luncheon hosted by Wade and Doreen Slinkard, and what wonderful company he was. Only two years ago he organized to take a busload of friends to a theatre production of “Ghosts”, and afterwards to dinner at an excellent Chinese Restaurant. My wife and I were privileged to be among his guests, and he would not let any of us, so much as buy a drink. Doreen Slinkard tells another story. In recent years Wade Slinkard had been training a few horses for Tom, who was thrilled to be back in the game. Horses like Hamburg, Legistation, Footy Fan and Stradazzle had won twenty three races between them, and Tom was enjoying a healthy punt, whenever the horses looked to be in the right race. The Slinkards were contemplating the installation of a walking machine on their Wilberforce property, and Tom got wind of it. A couple of days later, a representative from an appropriate company came to the property to measure up for a brand new walking machine- courtesy Mr. Sewell. I’ve spoken to several of Tom’s friends since his sudden passing on Everest day (Oct 13th), and the same three words kept coming up. Integrity, generosity and warmth, a beautiful blend of attributes which will serve as a lasting epitaph to the most likeable of human beings. Older PostWHERE DID EDUARDO COME FROM?